'Garudanagiri' is a small sleepy village about 30 km from the town of Arsikere. Long time back while travelling on this highway, we saw a board put up by the Tourism Dept.of Karnataka showcasing the history of this place, Garudanagiri. Though immediately it was in our to-explore list on our next visit around this place, it rather took us a lot of time for this next visit. After having lunch in Arsikere,we decided to check out this interesting place. We took a deviation towards Garudanagiri and drove until we reached the village. When we inquired the way to the fort, we got a response that there was a way until the top from right behind the temple present at the hill base. We reached the temple and started our trek. The fortification on the hill was quite visible from the start point. The weather was favorable which made our climb comfortable.We were protected from the sun's heat by the monsoon clouds and the not very warm weather. We were also excited and happy to see that much of the fortification was intact. As we entered the second tier, we found a Lord Hanuman temple and from here, passed through five more gateways. There is a temple at the top of the fort dedicated to Lord Shiva. 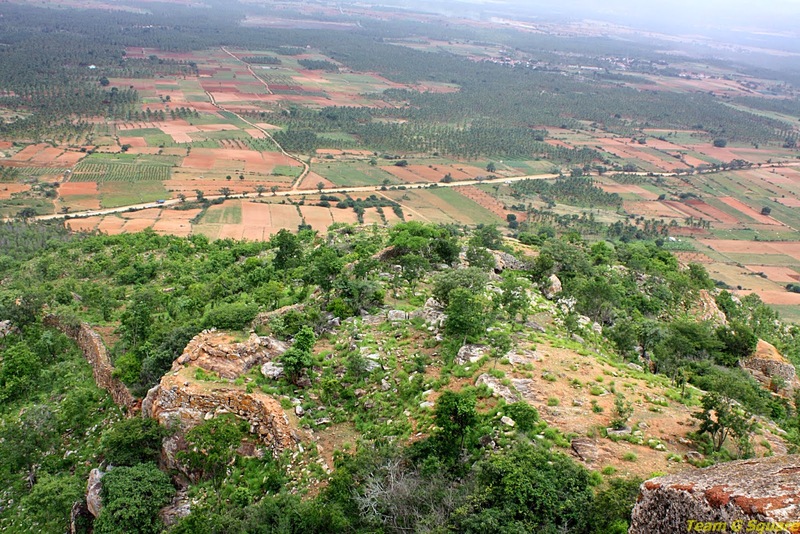 This fort being 7 tiered is believed to have been built during the Hoysala period by the body guard of King Vishnuvardhana who carried the name Garuda, thus the name Garudanagiri. Lots of other rulers have ruled this place. We spent some time at the top until the clouds turned dark and heavy after which there was a sudden downpour for a short while. The rain surely made our descent slippery and long as we had to watch every step. We reached our car and from here we headed towards Hire Nallur. You do take the most wonderful trips and I'm so glad you share them with us through your excellent photos!! They are the next best thing to being there myself!! Hope your week is going well!! Enjoy!! 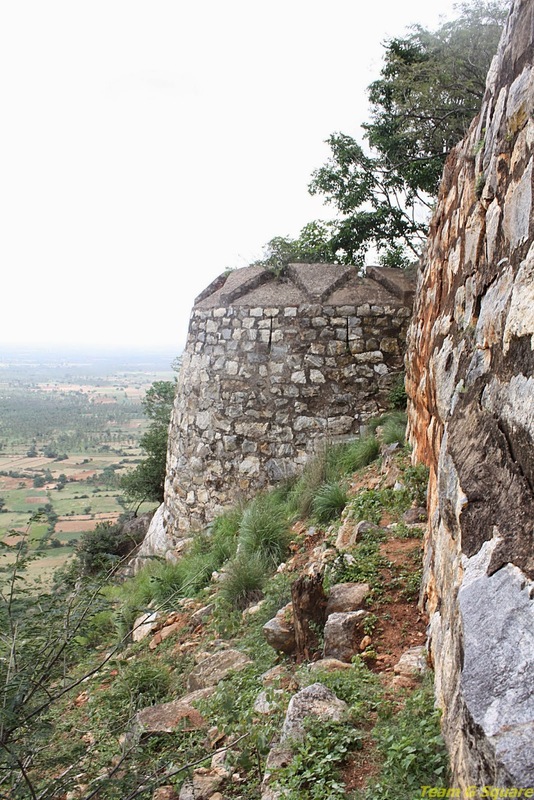 the fort walls and rocks are impressive! the view from up there is beautiful, too. Great shots of the fort and the view below. Interesting post and looks like a fun hike. This is a wonderful find. The views are brilliant and so is the fort. Wonderful. I am amazed at the places u go to. Now have to land in Bangalore and ask u to take me around. 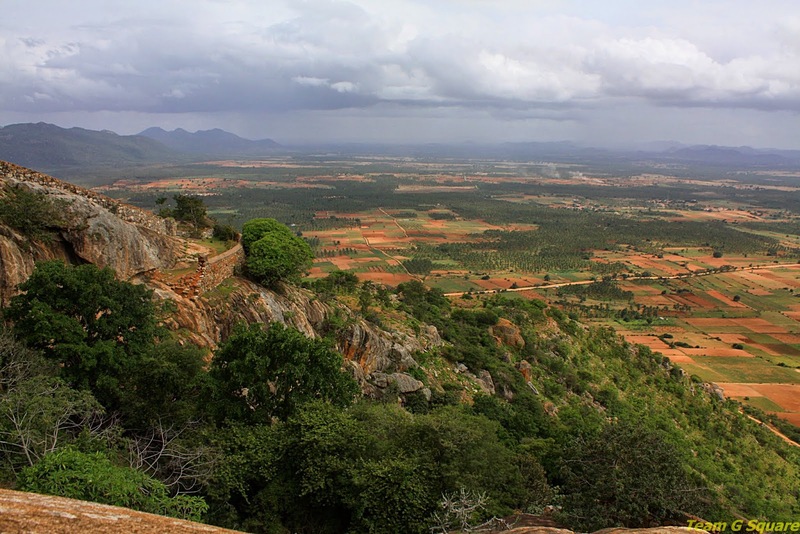 Captivating images & fascinating views from the hill top. ! Amazing!! I have seen this place each time I travel on highway. Looking at your post now, I feel that I must visit it!! Seems to be in a reasonably good shape? You should soon start a series on Discovery India channel!! The view from the top of this hill is amazing. It's wonderful that so much of the fort is intact. I'm glad you got to visit and took us along with you. Beautiful view of valley from Fort. Nice photo. I like last one! This is one wonderful trip indeed. A wonderful post about an interesting exploration. :) Thanks for sharing this. The pics are lovely! What a fort. I love the shot of the village below. Which season was it? Seems around the monsoons. Great shots of the place. Now it is in my wish list. A calm place! Was this built during Hoysala times? The views from the fort look amazing. Thank you for introducing my place here. I having some new photos how to upload to this page.